I have a unique challenge! I want to make a tree stencil to paint on my office wall. I found a tree but the challenge is that instead of leaves I want to put encouraging words, or words that the bible says I am. For example; blessed, beautiful, masterpiece etc. Does anyone know how to turn text into leave looking shapes? I am not very good at MTC YET! What a beautiful idea! I'm sure one of the clever people here will come along and help soon...don't think I'm up to trying that yet. Aww thanks Lynne! I hope someone does help me. What programs do you have to work with? @osaran so you want the word to "fill" or take the shape of the leaf? Sounds like a lovely concept! Might be a good webinar topic for Brian to illustrate and demonstrate... I know someone a while back - might have been even a year ago - was trying to do this with a name and a football shape... may need to searchand see if I can locate that thread - may have sonme ideas on how to do that that can transfer to leaf shapes too! I searched around for a dedicated program to distort a word to a specific shape, but did not find one. The closest that I could come was to use the distortion feature in Pazzles, Gazelle, or the free Funtime lite software. Save to WPC and import WPC into Make The Cut. Here is a quick word I made this way. @juliefes thanks! 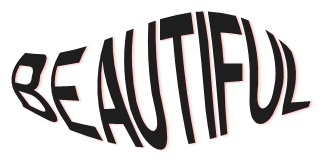 The word beautiful looks great! I am just not familiar with WPC. Sorry but what is that? Once installed, open the software. 1. Click on the T on the right side of the screen, select font, and type in your text, and click on OK.
2. Open a leaf file. I have attached a leaf file here that I used. 3. Resize the text so that it it about as long as the leaf by dragging a corner of the selected text until it is the size you want. Place the text over the leaf. 4. With the text selected, click on the Distortion icon, 4th from the bottom on the left side of the screen. 5. Drag the boxes and curved lines that appear around the text to where you want them to be. Click on Apply. 6.Go to the file menu, and select Save As. Name your file and Save. 7. Open Make The Cut. 8. Click on the WPC icon at the top of the screen. Browse to where you saved your text, select the file, and click on Open. 9. Your text is now ready to cut from MTC to your cutter. Save in MTC for future use.